It’s a good thing Mother Parkinson, a librarian, told her boys that people would never buy books from somebody on the Internet. 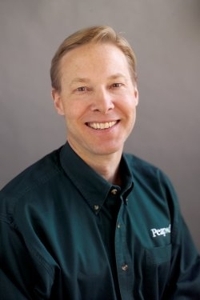 Otherwise, we might not have Peapod, the quintessential online supermarket serving about 260,000 customers from Boston to Milwaukee and from Washington, D.C., to Long Island, N.Y. Back in 1987, Thomas Parkinson thought selling books online would be a good thing. Mom didn’t. Thomas Parkinson, now 46, and his big brother (by two years) Andrew both knew something about the grocery business; both had worked for Proctor & Gamble in sales and marketing. Andrew also spent some time with Kraft foods. Thomas came out of college with a computer degree. They also knew something about the “New York minute” pace that many people maintained. Those double-income families with little time and less inclination to crawl the aisles of a grocery store two or more times a month would gladly pay a small fee to have their groceries shopped and delivered to them. But the story of the Peapod.com evolution and how the brothers Parkinson started taking grocery orders on the Internet is a little more complicated. It goes back to a time when the Internet was still the playground of academicians and military men. It was a time when names like Prodigy and Commodore were common, and words like modem and 300 baud and bulletin board were part of the lexicon. It also involved two brothers who felt a need to figure out where the next boom would take place and what they were going to do for a real-world living. Thomas Parkinson: My brother, Andrew was finishing his stint on the on the U.S. Olympic Windsurfing Team, and I was in my “find-myself” mode — on a trip around the world with some friends. Andrew and I had been kind of looking at the business world and trying to figure out what the 90s were going to bring. While I was gone, he took a job with Domino’s delivering pizza, and, at the same time, was researching various business niches. Every time I would come to an American Express office somewhere in the world there would be a package from Andrew with more of his research findings. Pretty soon, my backpack was jammed with papers and brochures and other materials. The other guys got a big kick out of it. The thing that he most warmed up to was the idea of delivering pizzas and videos. Meanwhile, he took a job helping a company in southern Illinois install special devices on televisions that had a chip and modem that would allow interactive TV. When he told me about that, I said we could use that kind of technology for the pizza and video thing. Then we got to thinking about the whole online world. It wasn’t hard for Thomas to make the leap. After school and his short stay at P&G, he ran a software company based on his own work developing search software for executive recruiting agencies. The younger Parkinson started thinking and talking about people using PCs and modems and ordering products online with the bulletin boards. Thomas Parkinson: Then we started thinking about starting an online mall and selling things. There wasn’t a lot going on. There were bulletin boards and some interactive stuff, but nobody was really doing ecommerce. We thought about the online mall and we thought about each mall having a grocery store tenant. If we could get people to have groceries delivered, we could sell them other stuff and we could also get some of the vendors to advertise — we could make money that way. The brothers began to get excited about the prospect of becoming mall merchants without actually having a mall. The groceries-online aspect was particularly exciting. So the older Parkinson, the researcher in the family, decided to do some testing. Thomas Parkinson: Andrew did a simple test. He shopped his own order, running around the grocery store, and it only took him 15 minutes. We based the original business model on shopping an order in 15 minutes. I can’t believe how wrong we were, not to mention the transportation we didn’t look at. Anyway, we started fleshing out the idea and decided this might be it. We talked about what we could sell in the mall, and I thought we could sell books, but my mother, who was a librarian, said nobody would every buy books online. So we decided to do groceries. Thomas and Andrew set about building a business plan they could sell to investors, suppliers and customers. They raised $25,000, mostly from family and friends, and Thomas began work on the software applications that would make the system function. Thomas Parkinson: To be honest, nobody had any idea of what we were talking about. My father said, “I don’t know what these guys are doing, but they’re my sons so I’ve got to get in.” We named the company Peapod because it sort of fit with the green grocer, fresh veggies thing, and we put together this nice presentationand went to Dominic’s Foods in Chicago, and they were like, “What is this?” In the end, though, they said they would be interested. Thomas and a hired programmer got serious about writing the software to make the system work, and by July 1990, they were done and the site was launched. Orders came to Peapod, then someone would shop an order and someone would deliver it. The brothers made a deal with Jewel Foods, agreeing they’d shop the orders at Jewel in return for access to the electronic pricing system. This ensured that prices online were exactly what they were in the stores. The first order came in on July 15, 1990. Thomas Parkinson: Our first customer was Jerry Pearlman from Zenith. We learned a lot from that first order. I shopped the order and my brother delivered it. He (Jerry) had ordered 25, 1-liter bottles of Diet Coke, and then my brother delivered it to this big corporate place with a security gate and everything. The only problem was, I had shopped caffeine-free Coke and he wanted the regular diet soda. Right there we realized this was a tough business. After six months of new lessons every day, the Peapod team had attracted about 1,000 customers. Most shopped a couple of times per month and spent about $150 per order. Runners who worked like Andrew had done when he was a Domino’s driver did the shopping and delivery. It was pure bootstrap. Thomas Parkinson: There was no model to follow; we just made it up as we went along. To attract customers, Jewel allowed us to pass out fliers at the stores. If somebody contacted us but didn’t have a modem or didn’t know how to hook it up, I went to the house and set up the modem and taught them how to make it work. I guess I set up about 500 modems in the early times. It was pretty grassroots and hands-on. But the model worked. The time-starved, double-income professional families in a tech incubator like Evanston, Ill., loved the concept. The Peapod concept spread to other markets. The company grew. In 1996, Inc. magazine said Peapod was one of the 500 fastest-growing companies in the nation. Thomas Parkinson: We built it up to where we had 50 retail stores where we shopped, and then we realized the model was wrong because we couldn’t scale it any more. That was when we realized we were going to have to shift to warehousing. We had major operations, but we had no inventory, no warehousing and no stores of our own. We were still following the Domino’s model. We were overrunning the stores, and our out-of-stock level was running 10 percent. That was our only real dissatisfier, and the only way to solve that was to have our own facilities. Peapod grew to about $65 million annual sales in the first eight years on the “Domino’s model,” using the drivers’ own cars and shopping Jewel Foods and other partner stores. Now the struggle to reinvent the company consumed the Parkinsons. They built warehouses and developed the brick and mortar side of a company that would support the growing online activity of Peapod. Peapod survived. Andrew cut a deal with Dutch grocery giant Royal Ahold to purchase 51 percent of the company, and a CEO, Marc Van Gelder, was appointed. Thomas Parkinson: Care for your customers and your employees. Know that you are never on autopilot. You are constantly worried about competition. You have to survey your customers every day. You have to measure your performance, and keep an eye on all the details. Now, I’ll admit I’m not working as hard now as when I was installing modems in customers’ homes, wearing a Peapod costume, and handing out brochures in a parking at CompUSA, but the company will never be on autopilot. The future for the Peapod duo? Keep an eye on the business; make sure the servers are fast, and the buying experience quick, pleasant and secure; make sure the inventory is what the customers want and be flexible and responsive. Want to know the family secret? Mom buys books from Amazon.